MR. SURFACER 500. MR. . This coating is useful for filling in bumps and dents in plastic models, scratches and for removing bubbles and finishing bases. 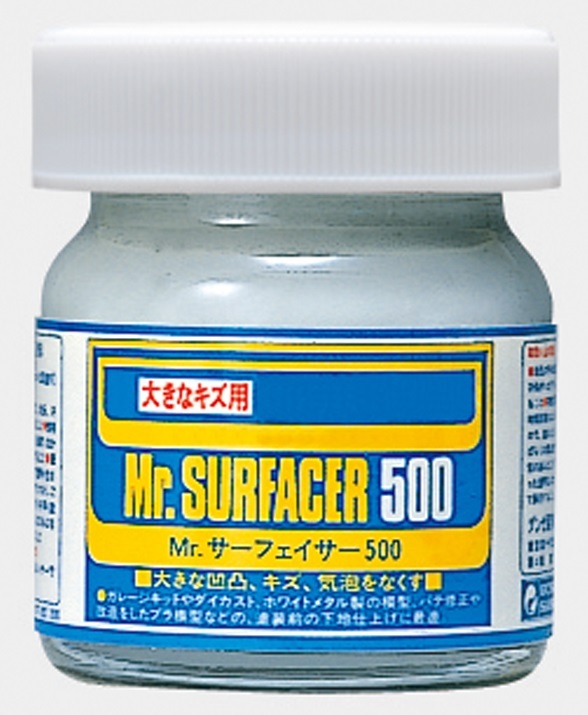 It is suitable for large scale repairs and can be used a soluble putty. MR. SURFACER 500 ES UN PRDUCTO PARA RELLENAR ASPEREZAS Y ABOLLADURAS EN LOS MODELOS DE PLASTICO. TAMBIEN PARA REPARACIONES MAYORES, RESANAR AGUJEROS Y DESVANECER LAS UNIONES ENTRE LAS DIFERENTES PIEZAS. ES UN PUTTY SOLUBLE. CONTENIDO 40ml.